Can you imagine starting a basketball team at a local YMCA and then end up seeing your team elected to the Basketball Hall of Fame? That’s exactly what happened to the Buffalo Germans back in 1895! 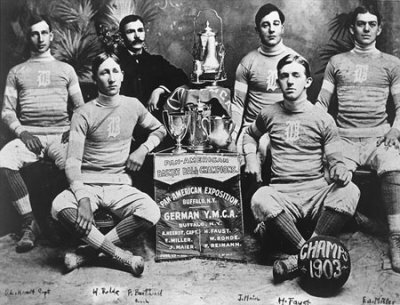 Six guys who frequently played basketball at the YMCA on Buffalo’s East Side decided to start a team and called themselves the Buffalo Germans. They were such an awesome team! They crushed the competition and won a lot of championships including the Pan American Championship in 1901 and the Olympic Exhibition title in St Louis in 1904. Between 1908 and 1910, the Germans had won 111 straight games! Wowza!!! And talk about team loyalty, by 1916, four of the original members had played together for over twenty years!! In 1925, after achieving a record of 792-86, the team disbanded. The Buffalo Germans were inducted into the Naismeth Memorial Basketball Hall of Fame in 1961, one of only eight teams that have been given that honor. Posted by fungoplay on April 6, 2012 in General.